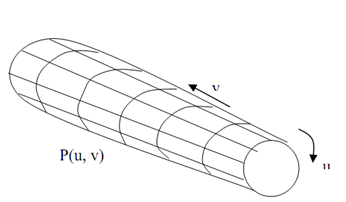 Figure demonstrates construction of a solid along with a translational sweep. Translating the control points of the periodic spline curve in (a1) produces the solid demonstrated in (b1), that surface can be illustrated with point function P(u, v). Here in the figure demonstrates Construction of a solid along with a rotational sweep. 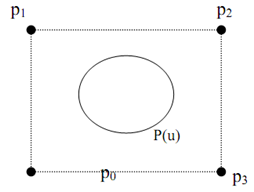 In (a2), rotating the control pints of the periodic spline curve about the specified rotation axis makes the solid demonstrated in (b2), such surface can be illustrated with point function P(u, v).